Today I received a complimentary set of Putco LED dome lights from Steve of www.xenondepot.com / KBcarstuff to review. I’ve been intending to replace all of my car’s replaceable bulbs with lower power LED equivalents, and Steve approached me at the right place and at the right time. The total cost to replace all my bulbs with LEDs amount to approximately $200.00. Steve at XenonDepot.com was nice enough to send me two sets of 9×9 and one set of 6×2 Putco LED panel. 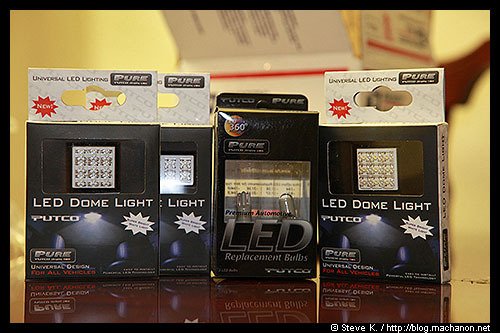 As a bonus, he also threw in a pair of Putco PURE 360-degree 194-wedge bulbs for my front city lights. I know quality when I see it and it only took two blinding seconds, literally, to see it. I was curious to see how these Putco panel LED work, so I did a quick install on my car at 10:00PM. I replaced the 5 year old Polarg hyper white dome light that was sitting in the driver side map light and pressed the button switch before replacing the map light cover, all the while staring at the Putco panel LED in the dark. As soon as the switch was pressed, a very bright light shot through the cabin and nearly blinded me! Side-by-side comparison, the old Polarg hyper white dome bulbs, which were a lot brighter than the stock dome bulb as it is, were dim compared to the new Putco lights. If the Polarg hyper white bulbs were PIAA hyper white headlight bulb replacements, then the Putco’s are definitely HID equivalent. Stay tuned for a comprehensive and unbiased review of these lights.